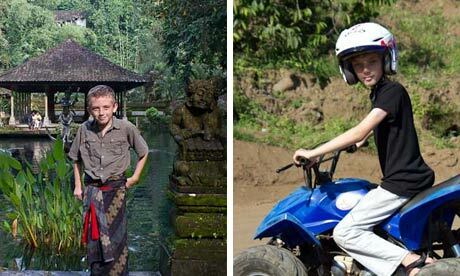 Zac in Bali, and swapping two wheels for four. Photographs: Theodora Sutcliffe. "Wow!" said my 10-year-old son, his eyes widening with envy. "Will you take a look at that bike?" Having covered several thousand miles of Indonesian roads on a bile-green and dirty cream Honda adorned with skull and crossbones stickers, Zac had a finely detailed appreciation of what was a good motorbike (this beast), and what was not (our chariot). "Yep," I said, flipping down the kickstand on our not-so-mean machine and picking the twilight flies out of my eyes. "That is a serious bike." Indonesia, the world's most populous island nation, is addictive. More than 17,000 islands stretch for over 3,000 miles across the Equator: its quarter of a billion people speak more than 700 languages and dialects. Zac and I first visited when he was nine, intending to cross the archipelago to Papua, its easternmost point. Side-tracked by treasure-seekers, nomadic hunter-gatherers, magical rituals, secret lakes and second world war weaponry, we never made it. This time, our planned one-year trip around the world having extended into long-term travel, we took a house in Bali, with the plan to head to Papua by way of the islands of Lombok, Sumbawa, Flores and Timor. Among the rice fields of Ubud, in verdant, Hindu Bali, life was easy. We bathed in spring water pools at a flawless temple, yodelled through the trees on zipwires, watched fluffy herons fill the palm trees like cottonwool flowers, dived a second world war wreck, rafted foaming rivers through narrow canyons, lounged in bamboo huts above a perfect beach, imbibed the local culture and gorged on international food. Zac learned silver-smithing, gamelan (the island's traditional music), fruit carving and yoga, sampled coffee processed through the intestines of a palm civet, made monsters to celebrate New Year and attended the cremation of one of the island's many kings: "Look, Mum! They're finishing him off with a flamethrower! Can I have a go?... Wow! Burning flesh smells gross!" And I learned to drive a motorbike, with Zac my patient pillion passenger. On Bali, as elsewhere in Indonesia, there is nothing rock'n'roll about riding a motorbike. It performs all the functions of the average family car. Everyone from tweens to octogenarians rides a motorbike. Bikes transport building materials, wardrobes, trays of sweetmeats, elderly relatives in funeral best and barrels of live fish. Even the quietest, most deserted, most jagged road will boast several shacks selling murky petrol from glass bottles, while the highways are lined with huts offering on-the-spot repairs and oil changes. A bike is a great way to travel Indonesia. Out in the fresh air, we could stop and go exactly where we pleased, without getting stuck in traffic as we would in a car: when it rained heavily, we put on ponchos, or just pulled over. The view, even from the pillion, is all-encompassing, while Indonesia's slow roads could have been made for biking. And motorbikes make up the majority of road traffic, so while the Indonesian driving style seems terrifying to the uninitiated, drivers are on the qui vive for bikes. So when it came to getting to Papua, a motorbike, Zac's favourite way of getting around Bali, seemed the natural and easy choice. As he put it: "There's nobody throwing up, like there are on the buses." On the island of Lombok, 20 miles east of Bali, there is a unique fusion of Islam and animism. Zac enjoyed an impromptu pottery lesson, explored a half-built airport, and learned to surf on a white sand beach framed by stark green hills. We cruised in style down sunlit roads used largely by horses and carts, had a personal tour of the regional museum and invitations to a Sasak wedding, cracked the skulls of pigeons and ate their brains, and wandered rural hamlets and the beaches of the Gili islands. 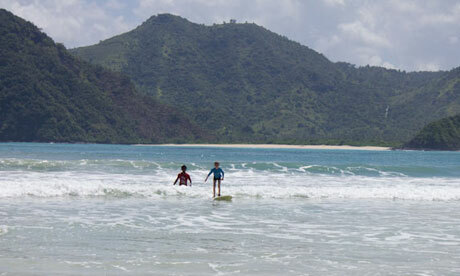 But on rugged Sumbawa, east of Lombok, our luck – and the roads – took a turn for the worse. The beginners' surf break we had come for was actually a savage slab of reef favoured by semi-pro surfers with muscles to match, and set amid camps for holidaying miners. The capital, Sumbawa Besar, or Great Sumbawa, signally failed to live up to its name. "Sumbawa," my son observed, "is the boringest island …"
We like to travel slowly, which is fortunate, since in most of Indonesia the roads make it impossible to travel fast. More than a couple of hours on a motorbike is a recipe for aching buttocks, so the longest distance we ever covered in a day was 200 miles, and most days we covered less than half of that. We spent plenty of time exploring, and not a little time stuck. Stuck by landslides while bulldozers remade the road; stuck while our bike, which consumed oil like a chip fryer, had a fit of the vapours; stuck by roads so steep and rocky our bike could not climb them carrying the two of us and our bags. Flores was a highlight. Komodo national park, on its western edge, is one of the best dive sites on earth: we dived with sharks, turtles and manta rays in water so clear and full of life it was like sinking into an aquarium. Zac, who has almost endless patience and an appetite for adventure, loved this. "There's not many 10-year-olds who have driven thousands of miles on a motorbike and dived with sharks, are there, Mum?" he said. In Flores we cruised along volcanic gorges past dazzling waterfalls and spiderweb-shaped rice fields, watched young men box with antlers in their hands at a harvest festival, slid down a natural waterslide and navigated myriad jungle roads in search of a drum made of human skin. Climbing through sullen clouds to the painted lakes of Kelimutu, we marvelled at pools of gold-flecked jade, black-green and turquoise, amid a landscape more Martian than lunar. We made friends, both of us, or more acquaintances, the passing friendships you make through travelling rather than the deeper friendships both of us have formed through longer stays and maintained with friends in London, once our home. As we boarded the ferry to Timor, the surf was so heavy the gangplank swung a metre into the air – it was as close to Evel Knievel as this not-terribly-competent biker gets. "You're on your own with this one, Mum!" exclaimed my son. Timor-Leste, one of the world's youngest nations (10 years old last month), was dusty and scarlet, with the dry gum scent of the Australian outback. We visited museums of the Indonesian occupation and massacre sites, stayed in the mountains at colonial resthouses and tranquil convents, and swam below the largest Christ statue east of Rio de Janeiro. We learned that, yes, you can lock your keys in a motorbike, that a waving child sitting on the pillion makes an excellent substitute for indicators and that Timorese traffic cops take their bribes bigger and less jovially than the Balinese. In Indonesian Timor, we explored a head-hunting fortress surrounded by beehive huts so low that Zac could not stand up inside them. We learned the old rituals, held the old weapons, heard stories of past hunting glory. We visited magnesium mines and brick factories, and binged on Padang food. And it was here, ironically, on our very last island, that Zac decided he had had enough. Not of the motorbike, although I had had a bellyful of that. "I want internet, Mum. I want a skyline! A town with things to do! Buildings more than two storeys high! I want civilisation!" We had been on the road for two months, and had still not made it to Papau, but it was Game Over. Back on Bali, as I exchanged our battered steed for an inch-and-a-half of Indonesian rupiah, a currency so underpowered that 1,000-rupiah coins exist, it was with a peculiarly conflicted sense of loss and relief. The breakdowns had been hell. Some of the roads, with savage, jagged rocks or rolling waves of mud that you could only negotiate slowly, had had me on the verge of tears. There had been moments of vulnerability, and danger. But it had been an adventure. Zac had learned an incalculable amount, about geology, nature, religion, language, the common humanity shared with people whose etiquette, rituals and beliefs are many miles from his own. And me? I had learned patience, I think, and tolerance. Plus, as a family, we were a team. "No more aching butts," Zac said, unromantically. He has less padding in that area than I do. "Yes," I said. "I don't think we'll do another big motorbike trip again." Just the other day we passed a trail bike parked against a wall, and stopped to stare. "That's a nice bike," Zac said. "A seriously nice bike," I replied. "If we do a motorbike trip again," he said. "We're going to do it on a bike like that." An International Driving Permit (theaa.com) is required for Indonesia. Bike hire in Bali can cost as little as 25,000 (around £1.75) rupiah a day, or £35 a month, from street touts or hire agencies: damage to the vehicle is the driver's responsibility. Most hire companies will not supply the paperwork required to take the bikes off the island, but a decent second-hand bike can cost around £450: resale is simple, but western-style vehicle insurance does not exist.